Let's take a deep look into COMEX in this article that describes COMEX today. All of us follow COMEX in New York and assess the 'net speculative long position' there, so as to see the actual weight of opinion on the gold price. It gives us a clear market opinion, after all. But many of you out there may believe that COMEX is a very large factor in the gold price. It may seem reasonable to you to assume that the 'net' position on COMEX would be covered by COMEX actually ensuring that this amount of gold or silver is held in one of their four COMEX approved depositories that are all located in New York city. After all, delivery of the gold and silver is effected via electronic warrant. This would reassure us that COMEX dealings did affect the gold or silver price, would it not? After all, supposing someone went short and could not deliver, who would supply the metals? The implications are that COMEX is constantly adjusting their gold & silver holdings to make sure that no-one would be left without the metal they bought there. Not so! - COMEX does not ensure the net long positions are covered by gold or silver. But, COMEX does perform oversight and regulatory due diligence, to ensure that no adverse events disrupt the marketplace to ensure that all market participants meet their contractual obligations. Yes, holders of COMEX approved depository electronic warrants can withdraw gold and silver from the depositories. So if a seller doesn't have the gold to supply to the buyer, what happens? - COMEX positions in spot (current) month Gold are settled by trading out (rolling) of the position or engaging in the Exchange delivery process. When someone wants to take delivery, they will establish a Long (buy) futures position and wait until a Short (seller) tenders a notice to delivery. Where does the gold come from, that's held in approved depositories? - Should you hold to delivery, you will get your gold! We match buyer and seller....one cannot exist without the other. The majority of positions are settled via trading as opposed to delivery. I cannot comment on where participants buy physical gold. - The gold contract is physically settled, meaning if you stay to delivery you must deliver gold or you receive gold. If you trade out of your position or roll into other month you are paid or must pay the difference. You must know that less than 1% of the trades actually go to delivery. - If a short does not have Gold to deliver he must liquidate his position by the last trading day. A short which goes to delivery must have the Gold in an approved depository. This is represented by the holding of electronic depository warrants. - Our markets are used primarily for price risk management or financial reasons.....although we can be a source of physical metal we are not used for that reason. The Exchange does not set the price - the market does. The gold price is created by the buyers and sellers. The exchange in no way determines the price....we only report it. The long and short of it is that COMEX is simply a 'cash' market that does not deal in gold or silver or other items at all. They simply provide a' cash' market where risks are laid off. Yes, physical dealers in gold and silver may well use the market to 'hedge' opposing real physical positions so that they don't face a price risk and yes, traders [or gamblers] use the market to take leveraged, speculative positions that are in no way backed by the physical possession of the metals. Take a look at the Diagram here and you see that 86% of trading in gold Futures and Options takes place in London and New York. This company needs to take delivery of a tonne of gold for the manufacture of jewelry between September and the November and then deliver it to retail jewelers. Its business is manufacturing only, but it finds itself at the mercy of a constantly moving gold price. These moves can be large enough to destroy profit margins. The head of the jewelry manufacturing company decides on when they enter the contract to buy the needed 1 tonne of physical gold. This may be at a time well ahead of September, the delivery date. He may believe that the price he can buy for is the lowest price he will see before September. So he goes 'long' of one tonne of physical gold just as he needs to be, so he can take delivery in September to get on with the business he is in. He does this by buying it on a bullion market, or from a refinery, or a bullion dealer. So he 'hedges' by selling a tonne of 'paper' gold on the Futures market. Now he hasn't 'zero' positions, but one physical long and one short hedge position, but zero risk, as any losses he makes on one position will be covered by profits on the other position. Now the price drops horribly. He then believes it has gone far too low, so he buys another tonne of paper gold on the Futures market and makes a profit [technical] from his short position. Now he is left with his original physical long physical position, a 'hedged' short position and a new long position. The effect of his profits on his short position has left him, in effect, with a much lower price on his physical long position. He is willing to open another short position to remove all risks if the price rises again. The price then rises again so he does open a new short position. Now he has four positions, three of which are in the Futures market. Each time he makes a 'profit' on matching positions, in effect he lowers his entry price. It is not uncommon for such a hedger to have 50 plus positions against the original exposure. He doesn't need a large change in price to continue increasing his positions. The reason it is not so speculative is that his original position needed hedging and subsequent actions are only undertaken when a profit is sure. What Will the Bank of Japan Think of Next? 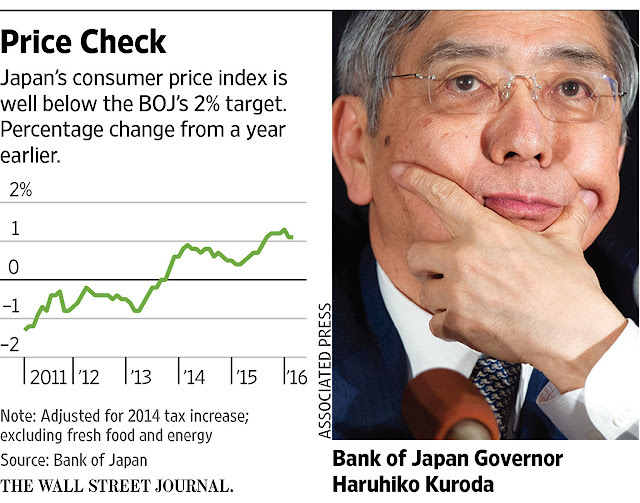 BOJ Chief Kuroda all but promised more monetary easing, but what buttons will he push? For the Bank of Japan, it is no longer if, but how. Bank of Japan Governor Haruhiko Kuroda all but promised more easing in an interview with The Wall Street Journal Monday, saying, “without hesitation we would adopt additional monetary easing” if deemed necessary. He most likely deems it very necessary, for two reasons. The first is the yen’s remarkable strengthening in recent months, which has put downward pressure on prices and thrown a major obstacle in front of the BOJ’s 2% inflation target. The second is the BOJ’s credibility. It is at stake after the central bank’s last surprise move—implementing negative interest rates in January—seemed to backfire, causing the yen to strengthen further. Time may yet prove negative rates effective. But for now, negativity in rates has simply created negativity about central banks in general. When the BOJ next meets April 28, it will be looking to prove it can still move markets in the right direction. So expect something unexpected—like massive equity purchases. The BOJ already scoops up ¥3 trillion ($27.57 billion) in ETFs each year as part of its broader ¥80 trillion program. HSBC HSBC 2.45 % ’s Izumi Devalier figures that could jump to ¥10 trillion. The BOJ could also take a cue from the European Central Bank and venture further into corporate bonds. That doesn’t mean investors should rule out another interest-rate cut. Mr. Kuroda may prefer to wait and see how the first cut plays out rather than double down so quickly, but his penchant for surprise shouldn’t be underestimated. And the initial move into negative rates left room to be much bolder. One thing Mr. Kuroda seems to have ruled out for now: so-called helicopter money, or direct government debt monetization. Of course Mr. Kuroda declared himself against negative rates, weeks before announcing them. Alas, perhaps the biggest move to restore confidence is out of the BOJ’s hands: canceling an increase in the value-added tax set to take effect in April 2017. That’s up to Prime Minister Shinzo Abe. There are inklings the prime minister may acquiesce. But unless the tax is shelved, any further BOJ easing may face another weak reception. BERN – There has never been a better time to break free from fossil fuels. Record-breaking global temperatures, plummeting fossil-fuel prices, historic investments in renewable energy, and global pressure to honor climate pledges are all coming together to create the ideal setting for this world-changing shift. Fortunately, the privileged position of fossil fuels already seems to be weakening. In fact, according to the International Energy Agency (IEA), global greenhouse-gas emissions and economic growth have already decoupled, with global energy-related CO2 (the largest source of human greenhouse-gas emissions) having remained at the same level for the second year in a row. This means that fossil fuels are no longer the lifeblood of our economy. 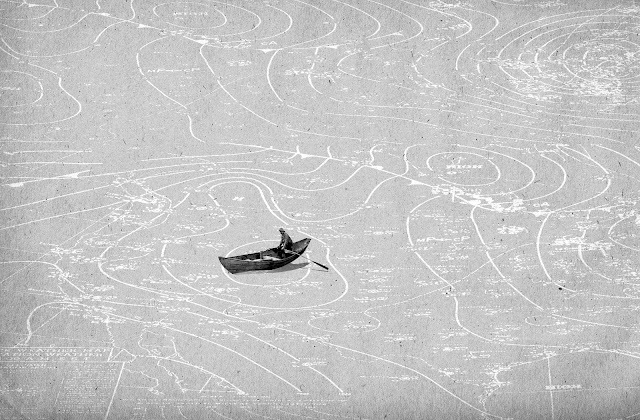 The world is closing in on a historic shift in our energy system. To accelerate progress, we must confront those who are profiting from climate change and defend the interests of ordinary people. Next month’s mobilizations against fossil-fuel projects are an important step in the right direction. The struggle finally to break free from fossil fuels is a global one. Nobody can afford to ignore it.